Josh and Anna Montgomery are trying to have a baby. Well, Anna is. Josh is making the minimum contribution necessary, and it’s ruining their relationship. Gabe Hawkins is trying to survive the wild ride that is life with his wife, Claire. It’s passionate everywhere but in their bedroom. For these four friends, the difficulties of their marriages are camouflaged by hazy happy hours, extravagant vacations, picturesque weddings, and sleeping in. The possibilities of their youth are wilting in the light of their waning twenties, and on one fateful night, four friends become two. Survivors become lovers. Truths are told, and nothing seems like forever anymore. Eliza Freed is an author that I stumbled across this year thanks to a blogging friend and I have devoured every book since. Once again, Eliza Freed delivers a winner with Josh & Anna and Gabe & Claire. This is one of those books that is totally addicting, totally captivating and totally unputdownable. From first to last word you will become entrenched in the marriages of Josh and Anna Montgomery and Gabe and Claire Hawkins and if you are anything like me, it won’t be enough. Josh & Anna and Gabe & Claire are best friends, Josh and Gabe work together and ever since the couples have been inseparable, from evenings out to holidays. Anna and Claire are total opposites, yet as friendships go they are tight knit, they just hit it off and never looked back. Anna is more low maintenance and down to earth, whereas Claire is all about appearances, spending her husband’s money and having a good time, but her heart is in the right place. The story is told in Anna and Gabe’s point of view, so one half of each couple, one female and one male. This was a novel concept and really worked as not only did we get an insight into each couple but also into them as best friends, through the female friendships we learned more about Claire and through Gabe we learned more about Josh. 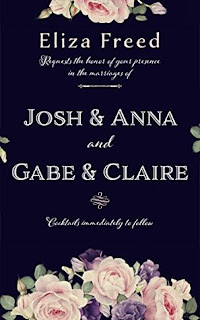 Neither marriage is flourishing, Josh & Anna are struggling with infertility and Gabe and Claire are just struggling with marriage in general. Gabe is definitely under the thumb and finds his marriage stifling to the point he even has to lie about going to the gym for fear of the repercussions. On one of their nights out this fearsome foursome become a woesome twosome addled with grief and guilt and frantically hanging onto one and other for some sense of normality. The two survivors form a formidable friendship and the way that Eliza Freed deals with this part of the story is empathetic and realistic. With many a tete a tete truths are told, feelings discussed and emotion and passion eventually take over. As with anything in life, nothing is at it seems and I found myself constantly pondering what the hell happened that night and found myself re-reading parts desperately trying to garner more information and find some little clue or snippet I may have missed. The mystery element of the accident is constant throughout the story and never dissipates even at the end, I actually found myself messaging the author begging and pleading for more, but the end was well done and definitely unforgettable. Eliza Freed delivers a fantastically executed story covering married life in general, grief and a second chance at love. There is no cheating, just an honest portrayal of many nights and weekends we find ourselves sharing with our besties and the real-life problems a lot of couples find themselves facing. Post-accident though, Eliza Freed really delivers the emotional side that I love in her writing and encompasses every aspect of the many stages of grief and turning those milestone corners. I loved everything about this book, but I will continue to champion for one scene that I want from two other point of views.